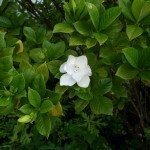 I have a 9-year-old gardenia bush that started in a 5-gallon container and now it has taken over the plot of land and could be a corsage for a T. rex. It is well watered (this week) in Houston, and it continues to bud and bloom. My wife does not want to trim it back -- afraid of damaging bloom potential. I want to be able to walk by without being grabbed.